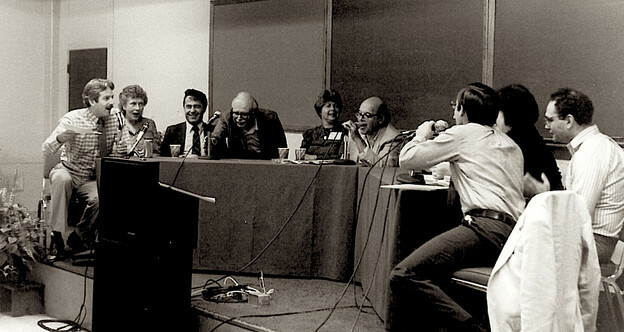 Perloff (center) with others at the "What Is a Poet?" symposium at the University of Alabama conference, 1984. Perloff’s writing in The Poetics of Indeterminacy: Rimbaud to Cage (Princeton University Press, 1981) is first and foremost addressed to resistant, uncomprehending, or skeptical readers. For a generation schooled in seeking and interpreting symbols in poetry, she proposes to delineate the pleasures of an Other Tradition that favors surfaces over depth and linguistic indeterminacy over symbolic coherence. One of the ways she wins over the reluctant reader is to show that the Other Tradition operates much more like a modern art than it does like a symbolist poetry. Speaking of Stein’s Susie Asado, for instance, she offers a comparison: “Just as Picasso’s structure of dismembered planes has no vanishing point, so Susie Asado has no fixed center; it becomes, in John Ashbery’s words, a ‘hymn to possibility’” (77). She follows this up with a statement that reveals her rhetorical designs: “Skeptical readers will object at this point, arguing that texts like Susie Asado are unnecessarily obscure, unreadable, and boring, and that Stein fails to communicate a coherent meaning to the reader.” To these readers — her own professors, reigning critics, or curious general readers — she offers a deliberate invitation and reasonable points of access to poetry that might seem to exclude them. This will remain her generous rhetorical stance throughout her career. In certain ways, The Poetics of Indeterminacy moves in two opposite directions, from two fixed points of comparison a century apart: Rimbaud and Ashbery. Perloff nominates these two poets to exemplify the tradition of “indeterminacy” she is sketching out; they provide consistent points for comparison in the chapters devoted to other poets. This fundamental insight that Rimbaud and Ashbery share an indeterminate poetics serves to inaugurate a working method Perloff employs in many of her other books: she finds among poets separated in time or space analogous poetic innovations; these analogies then counter a normalizing literary history based on chronology or nation by substituting the formal dialogue she constructs among seemingly disconnected poets. To present Ashbery as the best critic of Stein, for instance, is to suggest that the Other Tradition is built by formal affinities and by the inspiration later poets find in earlier ones, rather than by national projects or by epochal determinants. The Poetics of Indeterminacy is also an originary text in Perloff’s oeuvre in that it offers initial readings of her major touchstones: Stein, Williams, Duchamp, Pound, Beckett, Cage, and Antin. 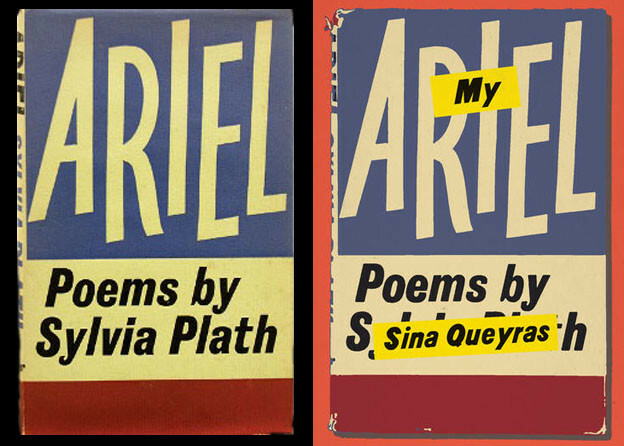 Throughout the corpus of her criticism, she returns to these figures as inaugurating or conceptualizing the parameters of poetry as a modern art. Over the years, as her restless attention shifts from art or philosophy to writers outside of English or to younger American, Canadian, and British poets, Perloff recurs to her touchstones to provide analogies for other innovative work. At the same time, she has become the foremost interpreter — interlocutor, really — of the poets loosely associated with Language writing and the digital, performance-based, conceptual, and constraint-bound writing that accompanies and extends it. By looking both to her touchstones and to the latest work, she extends the bidirectional method pioneered in The Poetics of Indeterminacy. My first encounter with her prodigious and omnivorous intellect was at a lecture Perloff (then at University of Southern California) gave at Stanford University while she was writing The Poetics of Indeterminacy. I was beginning a dissertation on American prose poetry, seeking to show the ways in which the poet’s prose of Stein, Williams, Creeley, and Ashbery makes possible such outcomes as the New Sentence of Language poetry. I remember so clearly the look of recognition that passed like a lightning bolt between my director, Albert Gelpi, and me as Perloff began to explain what she had in mind as a poetics of indeterminacy. Gelpi and I both knew instantly that here was a kindred spirit for the discoveries I sought to articulate. And with characteristic graciousness, Perloff suggested during our excited interchange following her lecture that I send her chapters as they were written. That welcoming gesture inaugurated a career-long critical dialogue that is one of the most generative conversations I have known.